Today, we honour all those who gave their lives in the First World War, and keep the memory of their heroism alive. April 25th, 2015 marks the 100th anniversary of the Australian and New Zealand Army Corps (ANZAC) military landing in Gallipoli, Turkey. They were joining an Allied campaign intended to capture the Dardanelles and Constantinople, forcing Turkey to surrender – a campaign which claimed the lives of over 44,150 Allies (21,255 from the United Kingdom alone), and 86,692 soldiers from the Ottoman Empire. Dug into trenches at the base of steep cliffs and bombarded from above by the Turks, more than eight thousand Australians and almost three thousand New Zealand soldiers lost their lives on this single stretch of beach before a retreat was ordered in December 1915. 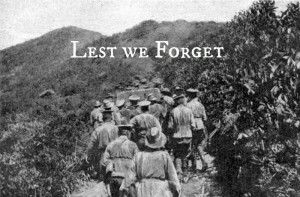 This retreat was achieved with no casualties, and the ANZAC story has become a vital part of the national identity of Australia and New Zealand.